Microvellum’s automated Solid Modeling Tools enable users to engineer complex, custom products quickly using architectural drawings and the power of AutoCAD. From the 3D model, users can analyze parts to create fully functional products that can be saved for future use or sent to production. At IWF Microvellum offered to take a glance at their 10-minute challenge at their Booth #4666. 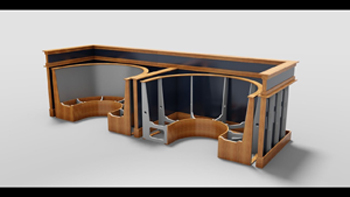 Microvellum offered visitors to take part in this challenge to learn how engineer and manufacture custom products like this banquette seating area offer faster and easier service than one’s competitors. • 3D Model Analyzation & Feature Recognition. • Use architectural drawings to engineer 3D Models. • Design & engineer complex products up to 70% faster. • Nest optimization for curved, tapper part unfolding. • Automated tool path assignment. • Eliminate labor intensive tasks and duplicated processes for converting solid model designs to machine ready products. • Save 3D models as fully functional Microvellum products that can be saved to a library where additional parametric properties may be assigned.